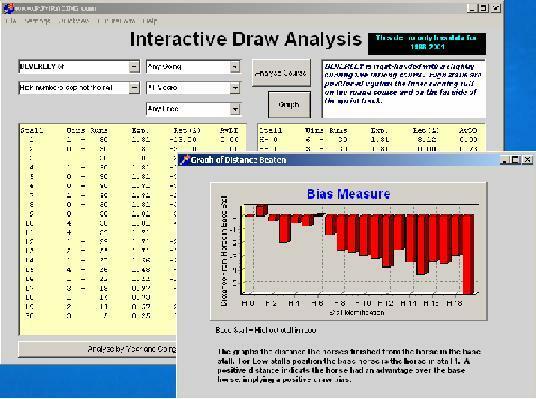 Use the draw analyser to identify the draw biases for over 300 different race track/distance combinations. Graph the effect showing the magnitude of the bias in average lengths beaten. Restrict the analysis to specific going ranges, stall positions, starting price of horses or time periods from 1992-2009. Once you have a draw bias use Future Form to check how well the poorly drawn horses ran next time out. Again you can restrict your analysis by setting many variables, such as draw of initial race winner, price, distance beaten etc.